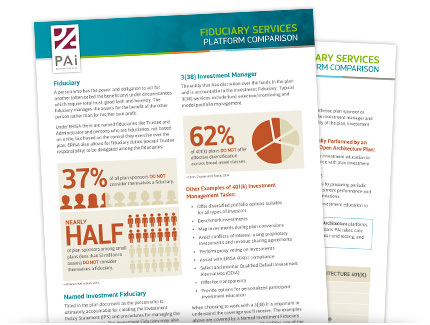 Whether you are a 401(k) specialist or manage a 401(k) plan as part of your client’s overall portfolio, PAi has pulled together tools to assist with selling and servicing your plans. PAi often hears advisors say that they don’t work with small business retirement plans, but companies of all sizes need retirement savings solutions too. Gain insight into the opportunities presented by small business retirement plans and how they can help you grow your business as an advisor. Looking for a turnkey retirement service that you remain the face of the plan while freeing yourself of the plan administration and investment advice? Learn about PAi’s CoPilot platform, its pricing, benefits, and compensation options for you—the advisor. Advisors are often tasked with choosing investment lineups and fund options. This tool allows you to compare potential investment lineups and review fund metrics to update or change funds in a selected plan. Once you’ve selected the funds you want to discuss with your client, you’ll have all the information you need to complete the investment selection page on your PAi proposal.